This description is based mostly on Markus Fritze's article. He is floppy expert and made some protections for Atari ST in past. I added couple things to it + rearranged some parts . Made without format's author contribution, this is certainly not complete. May contain some minor errors, but intention is to help people who want to do something more with thousands of STX images available - and not just playing under emulators. First must to say some relevant things: Pasti STX image format is not real floppy image. Of course, I talk about images available around. Is there some non/published variant with more details, more suitable for writing onto floppies - it is not on me to talk about. I examined over 1000 STX images already. There is 2 major type: made with stock Atari ST machine and public avail. SW. Another is made with Discovery Cartridge. Main difference between is way how track image is made. 'Public' images contain track images as WD1772 floppy controller reads them. Such images are good for emulators, but not (really) for writing onto floppy. Plus, track image can not hold sector data, and it must be stored separately, so such STX images are longer - typical size is 2.1x of same format unprotected floppy image. With DC made images can hold sector data inside track image, so size is usually 1.5x of same format unprotected floppy image. More later. Other relevant informations regarding copy protections: there is fuzzy bit mask, timing info for every sector, FDC status flag etc. All it is mostly in form suitable for emulation, and not for floppy write. No wonder - Pasti is made in cowork with Steem authors, and for sure with heavy usage of Steem Debugger + Pasti Debugger in. 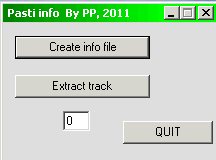 What are chances for having floppy write option from Pasti images one day ? How Pasti images can be used with HxC floppy emulator ? Update: HxC support is stopped at end of 2011. Someone just lost motivation . this is by images made with public tool and stock Atari ST .
images made with DC . with DC too, I guess. file points to the following track header. 0x08.w : number of sectors in the track - but some may be only sector address blocks, without sector data block - then loading time is 0 . 0x0E.b : track number - it is: 0 - last track on side A (usually 0-79 or 81), and 128 - last track on side B (128-207/9) . So, side is determined by bit 7 (clever) . 0x0F.b : Track image type flag: if 0 image is WDC track dump (public tool made). If 0xCC image is DC type . 7 - The track image data also contains a sync-offset to the beginning of the first sync marker. It is word at track image data start . 6 - If set, and track image type flag is 0 : the track is saved as an image with all gaps via the read track command. Sector contents are after track data (public t.). The reason is that WD1772 track read command looses sync during track read, so sector data is not properly read (more later). If set, and track image type flag is 0xCC: the track is saved as image with DC device. Sector data is usually embedded, but some may be after track image data. In all cases, sector data offsets must be calculated from track image data beginning - more later. If bit 6 clear, no track image data. 0 - If set the track is protected or with a non-standard sectorsize (!= 512 bytes). Well, it should be so. But in reality with public type images it is always set. So, by unprotected tracks too. Likely because there is always track image too. 0xC1 - Usually by made with DC - track is not saved with WD1772 read track command, but with DC - but not always. See track image type flag for sure.. Typical track length is about 6KB. Sector datas are inside track data. But some may be after . 0x61 : made with public tool. There is track image, as WD1772 read track command readed it. There are all sector datas too. It means that total track data is about 11KB. But in practice, track image is needed only for couple tracks (protections) or for none. So, there is overhead, caused by reason that images are made usually by people not able to determine what tracks are protected. 0x21 : there are only sector datas. No track dump. Usually by DC type. By public not - all tracks are usually with flag 0x61 . Empty tracks are with flag 0x21 and 0 sectors. Actually, then there is only track header present. If Bit 0 is clear, the track is unprotected and the number of sectors as stored in the track block header are simply saved as 512 byte blocks directly after the header. The track is therefore 16 + 512 * sectors bytes long. Rare case to see, even if most of tracks on many floppies are actually unprotected. If Bit 6 and 7 are clear, there is no track image and the sectors are stored just by order end length - just like the fuzzy sector mask, except this time for all sectors. Warning: sectors can be missing, if only a header was read, but the data was missing. The FDC status has Bit 4 (Record not found) set in this case. Bit Bit 6 and 7 is set, the track image is written with a track image header that has two words: the first one is a byte offset to the first 0xA1 address mark sync, the second word is the length of the track image in bytes. Usually DC type, but not always. If Bit 0 is set, the track header is first followed with the sector headers. One for each sector in the track, again 16 bytes per header. 0x00.l : sector offset relative to last sector header end , or to end of fuzzy mask if exists. is 0 as a sign for a stable read speed. Note: above 2 may be false, as part of the protection (Gold of the Aztecs + others) . (typically: 2=512 or 3=1024 bytes) - but may be more. Then only bits 0-1 matter. Following the fuzzy sector mask is the track data area . This area can contain either the sectors by itself (when no track image), or the complete track image with the sectors embedded (DC type), or the complete track with the sectors separate (following the track image) (public type). How they are stored is determined by Bits 6 and 7 in the track flags. If neither Bit 6 or 7 in the track flags is set, after the fuzzy sector mask, the sectors are written to the file. only the content of the sectors is written. Again with the sector size in the header taking into consideration. These tracks can be also easily recognized by sector offsets that are always a power of 2 (typically in 512 byte increments), starting at 0. Sometimes tracks are imaged in sidewise order: side A: track 0, 1, 2 ... 79 , then side B: track 0, 1, 2 ... 79 . Sometimes alternating: side A track 0, Side B track 0, side A track 1, side B track 1, etc. I don't see special flag for it, but it is easy to get order type by looking second track record - if there is 128 for track, then it is alternating type. Track data - may be track image self (public) or image containing sector datas. May missing. Sector data x sector count - if not in track image. It begins with track image header - 2 or 4 bytes depending on bit 7 of track flag. (see above) . As said in beginning there is 2 type of track image. WD 1772 floppy controller, used in Atari ST serie has track read command. But it reads track content not exactly as may expect - the point is that WD 1772 does resync during whole track read, so while reading sector data too. It results in reading not exactly what is written. More precise, the bit seq. %000101001 at any place in track will init resync, what causes that following bits will be readen not correctly. With DC made track images have no such problem, and I guess that can be used by floppy writing more-less direct. But do we really need track image for floppy write, and how it is used by copy protections ? First to answer on second: generally, by copy protections there is 2 way of track image usage: first, more common is using track read and testing for some specific data pattern, what differs from standard floppy format. For instance Copylock from 1988 will seek 2 byte serial right before first sector address block sync mark, on track 0. Normally, there are zeros. Second way is to use track image for data read. It allows lot of data - up to 6KB/track, but needs some special measures, to avoid false resync. By Maupiti Island all problematic sequences are prefixed with byte 7, by International Soccer Challenge with byte 0x0F (the effect is same). It avoids appearance of mentioned bit seq. so all bytes will be readen correct, after first and only sync. Loader rutine then must restoring correct data by removing prefixes and inserting correct values . Writing such track with regular Atari (or PC) is not possible . + 6KB/track is not possible anyway without special equipment. Back to possibilities to write floppies basing on WD1772 track image read: I guess that it is possible, at least by most. But needs proper conversion, what may be not easy. How Pasti works in practice ? Works well with Steem emulator, and likely with Saint too. HxC support is improved . And we have thousands of images avaialable around. But there is a lot of STX images for not copy-protected floppies. Because people can not judge what is really protected, and by some recommendations (do it with Pasti for sure) . Maybe the plan was that some team will verify Pasti images and make list which are really protected, which are OK ? Nothing from it is realised, for sure. Actually, author did nothing, really and literaly nothing in last 4 years. Or maybe 7 years, considering that public imaging tool (v0.4b) is made in 2005. Still beta ! In meantime count of images groved, and poeple want some details. I hope that this will at least partially satisfy needs. I already did SW for converting STX to STT format (only with specific protections, but already have about 60 working STT images, usable with HxC and some even writeable onto floppies). SW for shrinking oversized STX files by dropping unnecessary track images (only for experts). Maybe this can help to add STX support for some other emulator (Hatari) ? Technically, it seems as great achievement. As flaw I can count lack of checksum for Pasti files. Actually, it would be best to have checksums for all track datas separately. Considering not too reliable ways how STX images are transferred to PC: with transfer floppies, in multiple chunks, or via some cable connection between ST and PC. Even hard disk transfer is not 100 % safe. The best thing is that is possible to make images of copy protected floppies with stock Atari ST machines. And result of it is really lot of titles imaged. But looking about how author self supports it (or better said, how supports it not) I can only wish that someone other, with more sense for community and communication would do it. Credits go to Markus Fritze, Klaus Brod and hunderts of people who made Pasti popular by imaging, sending, uploading, hosting image files. version above - date, time and len is same ! 3D Pool Mirror Image , 16.4.2009 - P. Funny - same date, just this is 2 sided. Likely all 3 '3D Pool' images are from very same floppy . 5 Intelligent Strategy Games (2 flo) , 1.12.2005 - P, unprot. Mickey Mouse (2 flo) , 19.6.2006 - C, no tr. Wild Streets , 16.12.2004 - C, no tr. Notes: started by Alphabet, then choosing randomly few from STX collection with over 1500 images - taken from GameBase ST, diverse WEB sites (currently Atarimania is most active and has most) . Obviously aprox. 90 % is made with public tool . Are all Pasti images 100% OK ? What are chances that there are errors in STX image ? Usually people test STX images before make them public available. Test in Steem, of course. But how test ? I was not present at any of imaging made by someone other, but can say with confidence that at least 99% tests is made by checking only is game starts, until begin level, or couple levels more. And here is possible PROBLEM : I start with recent case: I imaged game Voyager with public Pasti. Floppy is 22 years old. Only with fourth floppy drive I got working STX image. Running game directly from floppy confirmed that problem is not Pasti - with first drive game worked not on real Atari from original floppy. I examined images, and found that error was exactly in copy protection. It is Copylock, and sector 6 on track 0 was readen incorrect in first 3 imagings. It is slower reading sector with fake CRC error. But must be readen 100 % correct - if not, game will not start. Pasti did not notice error - normal, as there is CRC error reported by FDC. It just confirms that CRC error is put there with purpose, to confuse copy SW. This was straight case, and imaging error was obvious after short testing. But we have a lot of copy protections with delayed effect. or performing check(s) in later game stage(s). It was btw., recommendetation of Rob Northen self too. So, it may happen that protection check fails, but game still will work well until some later stage. Or floppy read for protection check will happen on stage 11, for instance. So, the only reasonable answer is: we can not be in all cases sure that some Pasti image is 100% OK, because there are situations when image may contain error(s), mostly caused by age of floppy disks imaged, + by floppy drive, head align and similar. Pasti HW and SW is not enough sofisticated to detect all possible errors during imaging. So, playing games from STX image(s) until end is required test - about image correctness. It still not proves that every bit is readen correct, but is good check for correct imaging of crucial part: copy protection. Generally, copy protections are what makes floppy imaging very hard and troublesome. And obviously, the place where most likely it may fall. My opinion is that true preservation should include instead images of copy ptotected public releases : the sources of original, and executable SW in not copy protected form. But as things are in real World - it will be not much of such ever. Many source is lost forever, authors, copyright holders care not for preservation. They have no any copies, so for some SW only source is pirate crack. It is big shame for all involved, and maybe just indicates that all what interesting them is money. And that above is not only some dark scenery, theory: many of Atari ST floppies with game originals after 1989, 1990 have some copy protection with delayed effect. It may be over 200 titles. So, it is almost sure that some STX images are bad, considering that imaging was made when disks were aprox. 18 years old in average. As said, Pasti imaging is not flawless. Since author does nothing to better inform people about it, not giving any clues about advanced usage, I feel need to write here my experiences and recommendations to make images with less possible errors. If reading is unreliable some sectors may be readen bad. Then in normal case SW reports CRC errors. Pasti usually warns not, just writes readen, with CRC error flag on - assuming that it may be copy protection. The real bad thing is that quick checking of image will not show any errors, because need to play more-less to reach problematic part. It was case for instance with image of Kid Gloves posted at AF. Average user can hardly determine such problems - but examining STX file may give some clue - if there are CRC errors in middle of disk, over more sectors, it is likely not copy protection. What average user can, and actually need to do is: taking care about cleanliness of floppy drive. Floppies self is not recommended to clean, but methode of multiple reading will for sure make it cleaner. There are cases when imaging just don't work, and program stops. I will not go much in that here - reasons may be some not supported protection, or just very bad condition of disk. If cleaning helps not, it is likely too damaged, and impossible to get correct image. Still, it may be worth to keep such floppies. Some parts must be still OK - may help in building image from multiple sources. This initiates thoughts about how to coordinate hunt for missing rare titles ..
Another case, where image can fail is when copy protection is not enough tolerant, and happens with some floppy drives used by imaging. It is certainly rare case, but again, quick test of image may be noot enough. So, it may happen that drive gives index pulse little earlier or later than coders expected, and then copy protection check will detect it as pirate copy. I saw such in case of games To Be On Top and Rubicon. Btw. not enough tolerant code is not so rare case, and not only at copy protections. For instance famous FastCopy Pro 3 had problems with formatting floppies on several floppy drives - for me it never worked. It was corrected in later revisions. Fortunately, such 'bad' STX images (with little shifted track image) can be used to get 'perfect' copy - by running in Steem Debugger can see fine how copy protection check fails, and correcting STX image by shifting little problematic track image. Delayed protection problem is likely not only Pasti problem, but general problem with floppy images. DL PastiInf - usage help included. P. Putnik , Latest update: Jan. 2013.